Maybe someday that might be my life, but it’s certainly not now. I don’t go to the farmers market that often. Things get busy. Weekends go by too quickly. It just doesn’t happen. It’s a bit embarrassing to admit (an acquaintance was once telling me how great a local QFC is, and I asked what the price of an English cucumber is there, since it’s a fridge staple of mine, and he replied “Oh. I have no idea. I don’t buy produce at the grocery store. We get all our produce from farmers markets. Why of course. Silly me.). I beat myself up about it a good amount. I tell myself that if I was really a foodie, I would be a market regular. Sigh. So when I do get to the market, I get really excited. Last Sunday, I was giddy to be at the Ballard Farmers Market, and at the top of my list was spring onions, closely followed by rhubarb. After taking in some options, I settled on one vendor with beautiful rhubarb, and he happened to be offering a 2 for $5 deal on his bundles of gorgeous green and white guys. I’m always a sucker for a deal, so I went out of there with approximately 20 onions when I only need 3 for that night’s recipe. Yikes. After using a few in my favorite recipe, the remaining several hung out in my fridge all week long. By last night it was getting sad. They were withering. I needed to use them or they were SOL. And not using the produce I scored at the farmers market would make me feel even worse about myself than I already did for not going to farmers markets enough. I need to make things right. I perused the blogosphere for some inspiration, and settled on making an Asian flavored orzo salad. I was very pleased with the result. It was good enough to make me feel better about myself. I might not go to the farmers market as much as I “should,” but I can still whip up a healthy, fresh meal. 1. Toast sesame seeds in a dry pan over medium-low heat. Stir frequently. When light brown, remove from heat and let cool. 3. Bring water to a boil and add orzo. Cook to desired al dente-ness. Make sure you don’t cut the cooking time short; crunchy orzo is no good. 4. 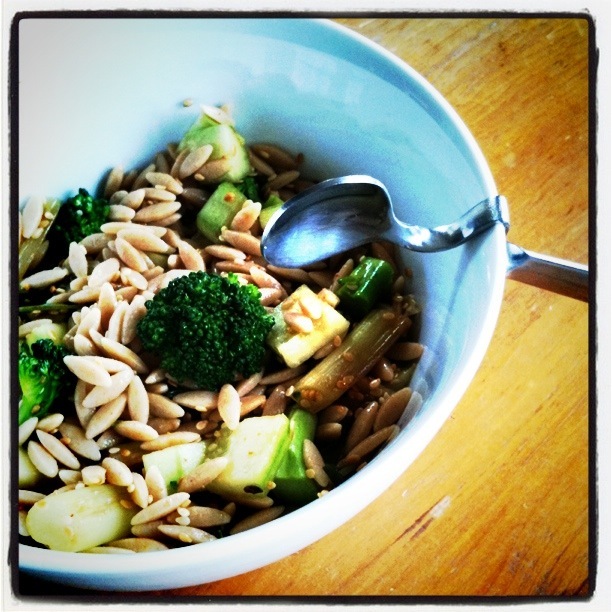 When orzo is near done, add the broccoli to the water. Drain all and rinse in cold water to stop the cooking. 5. Heat 1T sesame oil in a non-stick pan or wok over high heat. When oil is hot but not smoking, add scallions and cook, stirring frequently, until they are lightly browned and charred in places. Remove from heat and let cool slightly. 6. In a large boil, combine sesame seeds, sesame oil, soy sauce, and a dash of siracha. Chop cucumber and add to bowl. Add orzo and broccoli. Mix well. Add additional siracha and salt + pepper as desired. I completely forgot about müesli for awhile. A long while, actually. And then, last Sunday, I remembered it. So I made some. And now I’m enjoying it regularly. Life is good. When I was younger, müesli was one of those foods that seemed international and glamorous. I can’t remember the first time I had it, but I do remember that eating it always made me feel like I was Swedish, or French, or German. The price, however, was also quite glamorous. It’s one of those foods that just seems overpriced. There was one mainstream American brand who sold it, available at my small town supermarket. It was at least $6 a box, and needless to say, I didn’t get it often. It was a special treat. A special treat I sometimes had at home, and also devoured in those fancy places like France and Germany. For the past several years I’ve lived in or near a city, so müesli has undoubtedly been widely available. And probably still pricey. I haven’t priced it recently because, like I said, I’d forgotten about it. So, about my epiphany. Last weekend, the sun was shining and the temperature broke 60, and after a gorgeous run along Lake Washington, we needed to enjoy some coffee and breakfast on the deck. Pancakes or waffles seemed like too much work, but I wanted something a bit weekend-ish. You know, something more exciting than weekday breakfast. I saw yogurt in the fridge and thought, granola? None to be had. And that was the moment I remembered – müesli! Oh how I’d missed thee. So tasty. So healthy. So simple! This week I’ve been making my müesli in pint-sized jars, which is enough for 1-2 breakfasts. I’ve been really enjoying this combination of fruits and nuts, but they can of course be switched up to suit your preferences. 1. Fill jar 2/3 full with old-fashioned rolled oats. 3. Put top on, shake, and enjoy! Today is my sister’s birthday. Some might know today as Cinco de Mayo, but seriously people, how many of you can tell me the meaning of the holiday? Googling it today taught me it’s an American Civil War holiday, but I’m still not convinced it’s a necessary festivity. But I might just be being stubborn since I have more important things to celebrate on May 5th. But either way, today does come at a time of the year when everyone is anxious to throw off the winter blues and bust out with some spring cheer. In most some parts of the country, the sun has peaked out and temperatures have risen. Here in Seattle, we have some glimmers of spring, but not much yet. It’s coming though. We can taste it. I plan to be fully prepared for evenings on the deck celebrating a multitude of events, big and small. There are several drinks I look forward to having in my glass as I raise it for a toast, and one of them just might be enjoyed tonight. To wish my sister a HAPPY BIRTHDAY! Traditionally (always?) 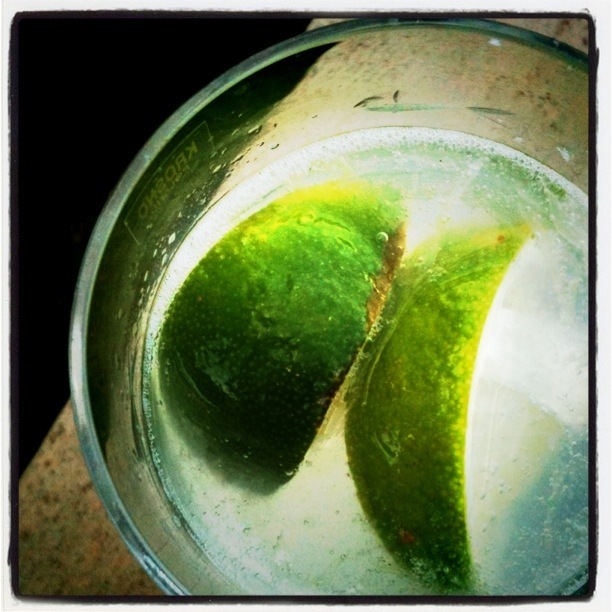 from Portugal, Vinho Verde wine is light and refreshing, with a lower alcohol content than many other white wines. It’s usually relatively cheap – I like the Broadbent Vihno Verde which is less than $10. Shutterbean created a boozed-up verison of a drink from Heidi Swanson’s new cookbook Super Natural Everyday.